There are several theories concerning the origin of the Dalmatian, none proven. That at the breed originated in northern India and was brought to Dalmatia, now a part of the Republic of Croatia, by bands of traveling Gypsies. The Dal has been known throughout Europe since the Middle Ages as a sporting dog, as evidenced by paintings dating from the 16th century which depict dogs of the Dalmatian type in hunting scenes. Dalmatians spots make them unique and their affinity for horses had given them many nicknames; these include "Coach Dog," "Carriage Dog," and "Fire House Dog." These are the roles that the Dalmatian is most famous for. Dalmatians are dogs of extreme stamina capable of traveling great distances, they trotted with the carriages, at first to protect the travelers from highwaymen, later their function was strictly ornamental. The Dalmatian also enjoyed life as a fire house mascot, particularly in the United States. At the first alarm the dog would race onto his perch on the horse-drawn fire wagon and often did his bit by locating fire victims and helping in their rescue. The Dalmatian has had many careers over the years; cattle drover, draught dog, and ratter, firehouse dog, tracker and sentinel in times of war, hunting wild pig, and circus performer because he is easily trained and very adaptable! 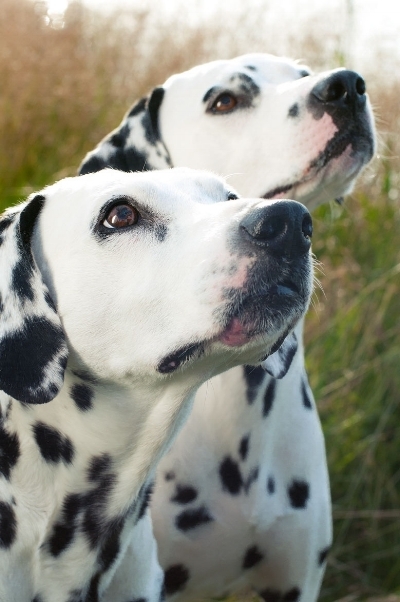 In 1890 the British Dalmatian Club was formed and a breed standard drafted. The Dalmatian was first registered in Canada in 1902.